Help with midlife gynecological conditions. Gynecology has come a long way in recent years, giving gynecology doctors and patients new and better alternatives to hysterectomy and menopause/perimenopause treatment. At Women Ob-Gyn Associates, Drs. Naheed R. Akhter and Amy K. Gaunt are experienced with the latest, minimally invasive surgical techniques, as well as hormone replacement therapy and care for women approaching menopause. Da Vinci, hormone replacement, menopause care and more. We offer abdominal, vaginal, laparoscopic and the da Vinci Surgical System® for hysterectomies and other gynecological surgeries. The da Vinci Surgical System is widely touted as today’s most effective, least invasive surgical treatment option – an effective alternative to traditional open surgery and laparoscopy. That means improved precision, significantly less pain and a faster return to normal activities. Dr. Akhter performs all the daVinci surgeries. We use hormone replacement therapy to correct hormonal imbalances that typically show up with age. And we are expert at treating menopause and its early cousin, perimenopause. We can also guide you in effective methods of prevention and treatment of osteoporosis. Gynecology Doctors Akhter and Gaunt are skilled in the latest technologies for treatment of perimenopausal heavy-bleeding periods, including NovaSure®. To learn more about care for midlife gynecological conditions, schedule your consultation today. We will explain your treatment options so you can make the best decisions for yourself. 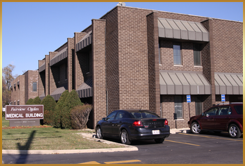 Our midlife gynecology patients come to us from Hinsdale, Naperville, Oakbrook, Lombard and Downers Grove in DuPage County, IL. We encourage, honor and welcome your referrals. For more information about our obstectrics and gynecology services, call Women Ob-Gyn Associates today at 630.719.9229 or use our online Request an Appointment form.